#1 "NEW YORK TIMES" BESTSELLER - NOW A MAJOR MOTION PICTURE - Look for special features inside. Join the Random House Reader's Circle for author chats and more. In boyhood, Louis Zamperini was an incorrigible delinquent. As a teenager, he channeled his defiance into running, discovering a prodigious talent that had carried him to the Berlin Olympics. But when World War II began, the athlete became an airman, embarking on a journey that led to a doomed flight on a May afternoon in 1943. When his Army Air Forces bomber crashed into the Pacific Ocean, against all odds, Zamperini survived, adrift on a foundering life raft. Ahead of Zamperini lay thousands of miles of open ocean, leaping sharks, thirst and starvation, enemy aircraft, and, beyond, a trial even greater. Driven to the limits of endurance, Zamperini would answer desperation with ingenuity; suffering with hope, resolve, and humor; brutality with rebellion. His fate, whether triumph or tragedy, would be suspended on the fraying wire of his will. 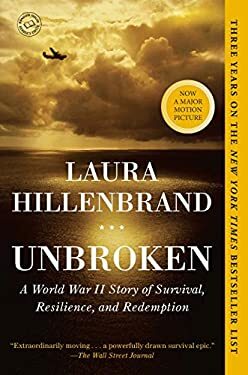 Appearing in paperback for the first time--with twenty arresting new photos and an extensive Q&A with the author--"Unbroken "is an unforgettable testament to the resilience of the human mind, body, and spirit, brought vividly to life by "Seabiscuit" author Laura Hillenbrand. Hailed as the top nonfiction book of the year by "Time" magazine - Winner of the "Los Angeles Times" Book Prize for biography and the Indies Choice Adult Nonfiction Book of the Year award "Extraordinarily moving . . . a powerfully drawn survival epic." --"The Wall Street Journal"" " " A] one-in-a-billion story . . . designed to wrench from self-respecting critics all the blurby adjectives we normally try to avoid: It is amazing, unforgettable, gripping, harrowing, chilling, and inspiring."" --New York""" "Staggering . . . mesmerizing . . . Hillenbrand's writing is so ferociously cinematic, the events she describes so incredible, you don't dare take your eyes off the page." --"People"" " "A meticulous, soaring and beautifully written account of an extraordinary life."" --The Washington Post"" " "Ambitious and powerful . . . a startling narrative and an inspirational book."" --The New York Times Book Review"" ""Magnificent . . . incredible . . . Hillenbrand] has crafted another masterful blend of sports, history and overcoming terrific odds; this is biography taken to the nth degree, a chronicle of a remarkable life lived through extraordinary times."" --The Dallas Morning News" "An astonishing testament to the superhuman power of tenacity." --"Entertainment Weekly"" " "A tale of triumph and redemption . . . astonishingly detailed." --"O: The Oprah Magazine"" " " A] masterfully told true story . . . nothing less than a marvel." --"Washingtonian"" " " Hillenbrand tells this] story with cool elegance but at a thrilling sprinter's pace."" --Time"" " "Hillenbrand is] one of our best writers of narrative history. You don't have to be a sports fan or a war-history buff to devour this book--you just have to love great storytelling." --Rebecca Skloot, author of" The Immortal Life of Henrietta Lacks"""
Used Good (7 available) Former Library book. Shows some signs of wear, and may have some markings on the inside. 100% Money Back Guarantee. Shipped to over one million happy customers. Your purchase benefits world literacy! Used Good (27 available) Shows some signs of wear, and may have some markings on the inside. 100% Money Back Guarantee. Shipped to over one million happy customers. Your purchase benefits world literacy! Used Very Good (4 available) Great condition for a used book! Minimal wear. 100% Money Back Guarantee. Your purchase also supports literacy charities. Used Good (6 available) Shows some signs of wear, and may have some markings on the inside. 100% Money Back Guarantee. Your purchase also supports literacy charities. New (427 available) BRAND NEW. Over 1.5 million happy customers. 100% money-back guarantee. Make your purchase count: support Better World Books' worldwide literacy partners.